Unique mosaics that can be used as field tile or cut into strips as liners/listellos. The Natural Stone portion of the above mosaics should be sealed with a penetrating sealer prior to grouting. Honed Decorative Basket Weave Mosaics: Four colour combinations in a basket-weave design in Honed Marble. Mesh backed. 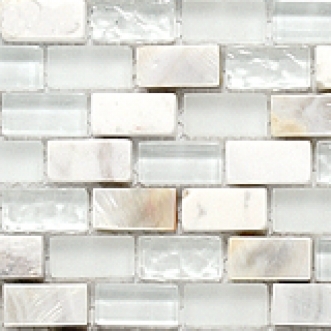 Yahly-Glass/Marble/Mother of Pearl Brick Mosaics (Mesh Mounted)- Extremely attractive combination of materials, the glass and shell chips providing a sparkling effect. Interlock Glass/Marble Mosaics Decors in blended colours in Glass and Polished Marble in pencil-thin tiles of irregular sizes. Light floor Traffic. May be used in wet areas - showers, steam showers, etc. - except swimming pools. Mother of Pearl is reported to be 100x stronger than any stone with a composition similar to Limestone. It is extremely difficult to cut. Clean with soft detergents containing no acid. All grouts are suitable. Honed Decorative Basket Weave Mosaics: Interior walls. Also, residential and some light traffic interior floors.